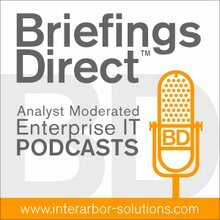 The next BriefingsDirect big-data solution discussion explores how a triumvirate of big-data players is delivering a rapid and efficient analysis capability across disparate data types for the healthcare industry. We'll learn how the drive for better patient outcomes amid economic efficiency imperatives has created a demand for a new type of big-data implementation model. This solutions approach -- with the support from Hewlett Packard Enterprise, Microsoft, and Sogeti -- leverages a nimble big-data platform, converged solutions, hybrid cloud, and deep vertical industry expertise. Here to share the story on how the Data-Driven Decisions for Healthcare initiative arose and why it portends more similar vertical industry focused solutions, we're joined by Bob LeRoy, Vice President in the Global Microsoft Practice and Manager of the HPE Alliance at Sogeti USA. He's based in Cincinnati. The discussion is moderated by me, Dana Gardner, Principal Analyst at Interarbor Solutions. Gardner: Why the drive for a new model for big data analytics in healthcare? What are some of the drivers, some of the trends, that have made this necessary now? LeRoy: Everybody is probably very familiar with the Affordable Care Act (ACA), also known as ObamaCare. They've put a lot of changes in place for the healthcare industry, and primarily it's around cost containment. Beyond that, the industry itself understands that they need to improve the quality of care that they're delivering to patients. That's around outcomes, how can we affect the care and the wellness of individuals. So it’s around cost and the quality of the care, but it’s also about how the industry itself is changing, both from how providers are now doing more with payments and how classic payers are doing more to actually provide care themselves. There is this blur between the lines of payer and provider. Some of these people are actually becoming what we call accountable care organizations (ACOs). We see a new one of these ACOs come up each week, where they are both payer and provider. Gardner: Not only do we have a dynamic economic landscape, but the ability to identify what works and what doesn't work can really be important, especially when dealing with multiple players and multiple data types. This is really not just knowing your own data; this is knowing data across organizational boundaries. LeRoy: Exactly. And there are a lot of different data models that exists. When you look at things like big data and the volume of data that exist out in the field, you can put that data to use to understand who are your critical patients, and how that can affect your operations? Gardner: Why do we look to a triangulated solution between players like Hewlett Packard Enterprise, Microsoft, and Sogeti? What is it about the problem that you're trying to solve that has led it to a partnership type of solution? LeRoy: Sogeti, a wholly-owned subsidiary of the Capgemini Group, has been a long-term partner with Microsoft. The tools that Microsoft provides are one of the strengths of Sogeti. We've been working with HPE now for almost two years, and it's a great triangulation between the three companies. Microsoft provides the software, HPE provides the hardware, and Sogeti provides the services to deliver innovative solutions to customers and do it in a rapid way. What you're getting is best in class in all three of those categories -- the software, the hardware, and the services. Gardner: There's another angle to this, too, and it’s about the cloud delivery model. How does that factor into this? When we talked about hardware, it sounds like there's an on-premises aspect to it, but how does the cloud play a role? LeRoy: Everybody wants to hear about the cloud, and certainly it’s important in this space, too, because of the type of data that we're collecting. You could consider social data or data from third party software-as-a-service (SaaS) applications, and that data can exist everywhere. You have your on-premise data and you have your off-premise data. The tool that we're using, in this case from HPE and Microsoft, really lend themselves well to developing a converged environment to deliver best in class across those different environments. They're secured, delivered quickly, and they provide the information and the insights that their hospitals and insurance companies really need. Gardner: So we have a converged solution set from HPE. We have various clouds that we can leverage. We have great software from Microsoft. Tell us a little about Sogeti and what you're bringing to the table. What is it that you've been doing in healthcare that helps solidify this solution and the rapid analysis requirements? Sogeti’s strength is that we're really focused on the technology and the implementations of technology. LeRoy: This is one of the things that Sogeti brings into the table. Sogeti is part of the Capgemini Group, a global organization with 150,000 employees, and Sogeti is one of the five strategic business units of the group. Sogeti’s strength is that we're really focused on the technology and the implementations of technology and we are focused on several different verticals, healthcare being one of them. We have experts on the technology stacks, but we also have experts in healthcare itself. We have people who we've pulled from the healthcare industry. We taught them what we do in the IT world, so they can help us focus best practices and technologies to solve real healthcare organizational problems, so that we can get toward the quality of care and the cost reduction that the ACA is really looking for. That’s a real strength that's going to add significant values to healthcare organizations. Gardner: It’s very important to see that one size does not fit all when it comes to the systems. Having industry verticalization is required, and you're embarking on a retail equivalent to this model, and manufacturing in other sectors might come along as well. Let's look at why this approach to this problem is so innovative. What have been some of the problems that have held back the ability of large and even mid-sized organizations in the healthcare vertical industry from getting these insights? What are some of the hurdles that they've had to overcome and that perhaps beg for a new and different model and a new approach? LeRoy: There are a couple of factors. For sure, it’s the complexity of the data itself. The data is distributed over a wide variety of systems. So it’s hard to get a full picture of a patient or a certain care program, because the systems are spread out all over the place. When the systems in so many different ways end up with you, you get part of the data. You don’t get the full picture. We call that poor data quality, and that y makes it hard for somebody who's doing analysis to really understand and gain insight from their data. Of course, there's also the existing structure that’s in place within organizations. They've been around for a long time. People are sometimes resistant to change. Take all of those things together and you end up with a slow response time to delivering the data that they're looking for. Access to the data becomes very complex or difficult for an end-user or a business analyst. The cost of changing those structures can be pretty expensive. If you look at all those things together, it really slows down an organization’s ability to understand the data that they've got to gain insights about their business. Gardner: Just a few years ago, when we used to refer to data warehouses, it was a fairly large undertaking. It would take months to put these into place, required a data center or some sort of a leasing arrangement, and of course a significant amount of upfront costs. How has this new model approached those costs and length of time or ramp-up time issues? HPE is providing a box that’s going to allow me to put both into a single environment. So that’s going to reduce my cost a lot. LeRoy: Microsoft’s model that they have put in place to support their Analytics Platform System (APS) allows them to license their tools at a lower price. The other thing that's really made a difference is the way HPE has put together their ConvergedSystem that allows us to tie these hybrid environments together to aggregate the data in a very simple solution that provides a lot of performance. If I have to look at unstructured data and structured data, I often need two different systems. HPE is providing a box that’s going to allow me to put both into a single environment. So that’s going to reduce my cost a lot. They have also delivered it as an appliance, so I don't need to spend a lot of time buying, provisioning, or configuring servers, setting up software, and all those things, I can just order this ConvergedSystem from HPE, put it in my data center, and I am almost ready to go. That’s the second thing that really helps save a lot of time. The third one is that at Sogeti Services, we have some intellectual property (IP) to help the data integration from these different systems and the aggregation of the data. We've put together some software and some accelerators to help make that integration go faster. The last piece of that is a data model that structures all this data into a single view that makes it easier for the business people to analyze and understand what they have. Usually, it would take you literally years to come up with these data models. Sogeti has put all the time into it, created these models, and made it something that we can deliver to a customer much faster, because we've already done it. All we have to do is install it in your environment. It's those three things together -- the software pricing from Microsoft, the appliance model from HP, and the IP and the accelerators that Sogeti has. Gardner: Bob, let’s look at this now through the lens of that consumer, the user. It wasn’t that long ago where most of the people doing analytics were perhaps wearing white lab coats, very accomplished in their particular query languages and technologies. But part of the thinking now for big data is to get it into the hands of more people. What is it that your model, this triumvirate of organizations coming together for a solution approach, does in terms of making this data more available? What are the outputs, who can query it, and how has that had an impact in the marketplace? LeRoy: We've been trying to get this to the end users for 30 years. I've been trying to get reports in the hands of users and let them do their own analysis, and every time I get to a point where I think this is the answer, the users are going to be able to do their own reports, that frees up guys in the IT world like me to go off and do other things, it doesn’t always work. This time, though, it's really interesting. I think we have got it. We allow the users access directly to the data, using the tools that they already know. So I'm not going to create and introduce a new tool to them. We're using tools that are very similar to Excel, that point to a data source that’s well organized for them already and it’s the data that they are already familiar with. This is something that we couldn't do before, and it’s very exciting to see that we're able to gain such insights and be able to take action against those insights. So if they're using Microsoft Excel-like tools, they can do Power Pivots and pivot tables that they've already being doing, but just in an offline manner. Now, I can give them direct access to real-time data. Instead of waiting until noon to get reports out, they can go and look online and get the data much sooner, so we can accelerate their access time to it, but deliver it in a format that they're comfortable with. That makes it easier for them to do the analysis and gain their insights without the IT people having to hold their hands. Gardner: Perhaps we have some examples that we can look to that would illustrate some of this. You mentioned social media, the cloud-based content or data. How has that come to bear on some of these ways that your users are delivering value in terms of better healthcare analytics? LeRoy: The best example I have is the ability to bring in data that’s not in a structured format. We often think of external data, but sometimes it’s internal data, too -- maybe x-rays or people doing queries on the Internet. I can take all of that structured data and correlate it to my internal electronic medical records or my health information systems that I have on-premise. If I'm looking at Google searches, and people are looking for keywords such as "stress," "heart attacks," "cardiac care," or something like that, those keywords, I can map the times that people are looking at those kinds of queries by certain regions. I can tie that back to my systems and ask what the behavior or the traffic patterns look like within my facility at those same times. You can target certain areas to maybe change my staffing model, if there is a big jump in searches, do a campaign to ask people to come in and do a screening, or encourage people to get to their primary-care physicians. There are a lot of things we can do with the data by looking just at the patterns. It will help us narrow down the areas of our coverage that we need to work with, what geographic areas I need to work on, and how I manage the operations of the organization, just by looking at the different types of data that we have and tying them together. This is something that we couldn't do before, and it’s very exciting to see that we're able to gain such insights and be able to take action against those insights. Gardner: I can see now why you're calling it the Data Driven Decisions for Healthcare, because you're really applying data science to areas that would probably never have been considered for it before. People might use intuition or anecdote or deliver evidence that was perhaps not all that accurate. Maybe you could just illustrate a little bit more ways in which you're using data science and very powerful systems to gather insights into areas that we just never thought to apply such high-powered tools to before. LeRoy: Let’s go back to the beginning when we talked about how we change the quality of care that we are providing. Today, doctors collect diagnosis codes for just about every procedure that we have done. We don’t really look and see how many times those same procedures are repeated or which doctors are performing which procedures. Let’s look at the patients, too, and which patients are getting those procedures. So we can tie those diagnosis codes in a lot of different ways. The one that I think I probably would like the best is that I want to know which doctors perform those procedures only once per patient and have the best results come from the treatments that that doctor performs. Now, if I'm from a hospital, I know which doctors perform which procedures the best and I can direct the patients that need those procedures to those doctors that provide the best care. My quality of care goes up, the patient has a better experience, and we're going to do it a lower cost because we're only doing it once. And the reverse of that might be that if the doctor doesn’t perform that procedure well, let’s avoid sending him those kinds of patients. Now, my quality of care goes up, the patient has a better experience, and we're going to do it a lower cost because we're only doing it once. Gardner: Let’s dive into this solution a bit, because I'm intrigued by the fact that this model of bringing converged-infrastructure provider, a software provider and expertise in the field that crosses the chasm between a technology capability and a vertical industry knowledge-base works. So let’s dig in a little bit. The Microsoft APS, tell us a little bit about that -- what it includes and why it’s powerful and applicable in this situation? LeRoy: The APS is a solution that combines unstructured data and structured data into a single environment and it allows the IT guys to run classic SQL queries against both. On one side, we have what used to be called parallel data warehouse. It’s a really fast version of SQL Server. It's massively parallel processing and it can run queries super fast. That’s the important part. I have structured data that I can get to very quickly. The other half of it is HDInsight, which is Microsoft's open source implementation of Hadoop. Hadoop is all unstructured data. In between these two things there is PolyBase. So I can query the two together and I can join structured and unstructured data together. Then, since Microsoft created this APS specification, HPE then implemented that in a box that they call a ConvergedSystem 300. Sogeti has used that to build our IP against. We can consume data from all these different areas, put it into the APS, and deliver that data to an end user through a simple interface like Excel or Power BI or some other visualization tool. Gardner: Just to be clear for our audience, sometimes people hear appliance and they don't think necessarily big scale, but the HPE ConvergedSystem 300 for the Microsoft APS is quite significant with server storage, networking technologies, and large amounts of data, up to 6 petabytes. So we're talking about some fairly significant amounts of data here, not small fry. LeRoy: And they put everything into that one rack. We think of appliance as something like a toaster that we plug in. That’s pretty close to where they are, not exactly, but you drop this big rack into your data center, give it an IP address, give it some power, and now you can start to take existing data and put it in there. It runs extremely well because they've incorporated the networking and the computing platforms and the storage all within a single environment, which is really effective. Gardner: Of course, one of the big initiatives at Microsoft has been cloud with Azure. Is there a way in which the HPE Converged Infrastructure in a data center can be used in conjunction with a cloud service like Azure or other cloud, public cloud, infrastructure-as-a-service (IaaS) cloud or even data warehousing cloud services that accelerates the ability to deliver this fast and/or makes it more inclusive or more types of data for more places? How does the public cloud fit into this? One of the great things about the solution that Microsoft and HPE put together is it’s very much a converged system that allows us to bridge on-prem and the cloud together. LeRoy: You can distribute the solution across that space. In fact, we take advantage of the cloud delivery as a model. We use a tool called Power BI from Microsoft that allows you to do visualizations. The system from HPE is a hybrid solution. So we can distribute it. Some of it can be in the cloud and some of it can be on-prem. It really depends on what your needs are and how your different systems are already configured. It’s entirely flexible. We can put all of it on-prem, in a single rack or a single appliance or we can distribute it out to the cloud. Gardner: And of course, Bob, those end users that are doing those queries, that are getting insights, they probably don’t care where it's coming from as long as they can access it, it works quickly, and the costs are manageable. Gardner: Tell me a little bit about where we take this model next -- clearly healthcare, big demand, huge opportunity to improve productivity through insights, improve outcomes, while also cutting costs. You also have a retail solution approach in that market, in that vertical. How does that work? Is that already available? Tell us a little bit about why the retail was the next one you went to and where it might go next in terms of industries? LeRoy: Sogeti is focused on four major verticals: healthcare, retail, manufacturing, and life sciences. So we are kind of going across where we have expertise. The healthcare one has been out now for nine months or so. We see retailers in another place. There are point solutions where people have solved part of this equation, but they haven’t really dug deep in understanding how to get it from end to end, which is something that Sogeti has done now. From the point a person walks into a store, we would be alerted through all of these analytics that we have. We would be alerted that the person arrived and take action against that. We do what we can to increase our traffic and our sales with individuals and then aggregate all of that data. You're looking at things like customers, inventory, or sales across an organization. That end-to-end piece is something that I think is very unique within the retail space. After that, we're going to go to manufacturing. Everybody likes to talk about the Internet of Things (IoT) today. We're looking at some very specific use cases on how we can impact manufacturing so IoT can help us predict failures right on a manufacturing line. Or if we have maybe heavy equipment out on a job site, in a mine, or something like that, we could better predict when equipment needs to be serviced, so we can maximize the manufacturing process time. We're looking at some very specific use cases on how we can impact manufacturing so IoT can help us predict failures right on a manufacturing line. Gardner: Any last thoughts in terms of how people who are interested in this can acquire it? Is this something that is being sold jointly through these three organizations, through Sogeti directly? How is this going to market in terms of how healthcare organizations can either both learn more and/or even experiment with it? LeRoy: The best way to do it is search for us online. It's mostly being driven by Sogeti and HPE. Most of the healthcare providers that are also heavy HPE users could be aware of it already, and talking to an HPE rep or to a Sogeti rep is certainly the easiest path to move forward on. We have a number of videos that are out on YouTube. If you search for Sogeti Labs and Data Driven Decisions, you will certainly find my name and a short video that shows it. And of course sales reps and customers are welcome to contact me or anybody from Sogeti or HP.